These color changing rings will change color based off of your body head and the surrounding temperature. They can be worn with your costume or as part of your everyday jewelry. 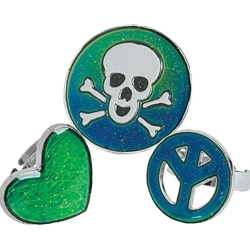 The color changing rings are made of metal and come in assorted designs. Price is for one ring.